Business analysis, and the formulation of improvement programmes, can often appear very complex and daunting. We have found people usually welcome an approach or ‘methodology’ which enables them to easily see and understand the factors which may come into play. Our change and improvement solutions are structured around our maBI (Model of Analysis for Business Improvement) techniques. 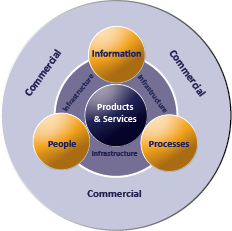 This involves assessment and design methodologies for the composition and interactions between People, Processes, Information and Infrastructure – the key elements of a business or organisation involved in delivering services or products – in a Commercial context. We have developed a series of assessment, evaluation and reporting tools to plan and manage the change needs under each of these headings to provide an optimum and balanced improvement solution. The success of the maBI model in delivering change effectively has been proven through its implementation within a range of dynamic organisations, and across a wide number of sectors. See our Customer Timeline to find out how we have helped others. The maBI model is also fully aligned with many commonly adopted and widely recognised management standards, such as ISO 9001, the Business Excellence Model and Investors in People. Businesses are typically involved in creating and delivering Products and/or Services (to Customers). A clear understanding of the nature of these products, services and specific objectives associated with their delivery is the starting point for analysis. What is to be achieved? Are the objectives being achieved? Each primary ELEMENT comprises 3 constituent COMPONENTS, which exist and interact at variable levels of effectiveness. We analyse these in turn to assess their comparative and collective strengths and weaknesses. The intellectual property and copyright within and for the maBI approaches and solutions lies exclusively with Change this Limited. The Model may not be used or reproduced in part or whole (this includes graphical or functional / operational) in any way without the express written permission from the Directors of Change this Limited. For IP reasons, the model is not shown here in its entirety. Unlock your potential. Get in touch today. Book a free, no obligation consultation with our experts to discuss your business needs. Just let us know whether you’d prefer a phone call or a face-to-face meeting, and one of our team will be in touch to arrange a consultation at a time that’s best for you.